Weight Management : Spice Up Your Health with Cinnamon! 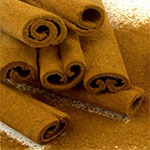 Once more valuable than gold, cinnamon is still a priceless addition to you daily diet. It not only adds a delicious flavor to a number of dishes but can also benefit your health andweight loss progress. According to several studies, cinnamon has been shown to lower blood sugar levels. Not only does this make it an ideal spice for people with diabetes, but balanced blood sugar levels also help you avoid cravings and burn fat more efficiently. Therefore, consumingcinnamon can help improve your diet results. Cinnamon is full of nutrients, including manganese, iron and calcium. It has been shown to lower cholesterol and triglycerides and is known for having anti-oxidant, anti-inflammatory and anti-fungal properties. Whether you suffer from arthritis, PMS, a yeast infection, a cold or an intestinal issue, cinnamon may help you find reliefnaturally. Additionally, the smell of cinnamon has been shown to boost brain function and memory. When you think of cinnamon, you likely think cinnamon rolls and cider. But the possibilities are just as numerous as its benefits: Sprinkle it on your cereal or oatmeal, mix it in (Greek) yogurt or smoothies and even add it to your dry rub or chili. We recommend using a maximum of 1/2 tsp of cinnamon per day. Enjoy!